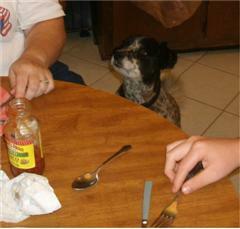 She is persistent, just asking for a crumb, and He rewards her, but I never liked that story. It doesn’t seem proper for Jesus to try to turn someone away just because they are not the right sort of person; to liken them to a dog, and say in effect “It’s not my job to deal with you.” Besides, since I am not a Jew, I suppose that puts me right in the dog house with that lady. That’s what I used to think. Today I am thinking a little differently. Jesus says it is not good to give the children’s food to the “little dogs.” The puppies. But maybe it’s not a bad thing to feed puppies, it’s just bad that the children of Israel won’t eat the banquet the Father has served and it’s not a good thing to have to give the arrogant, spoiled children’s food to the puppies. It’s no reflection on the puppies, only on the children. The children are the Jews of His day who would not accept Him and the banquet He had provided. The puppies are those like my dog. The humble ones who wait patiently, expecting food from the Master’s table. The ones who are not too proud to beg for the Master’s mercy. The ones that know that anything worth having must come from His hand. The ones who depend on Him for their very life. These are the puppies in this story. And we are blessed indeed if we, like the faithful woman from Canaan, can count ourselves as one of them. Wonderful Perspective….. a puppy’s point of view. I like it. Grateful.